I love fairy tales. And I love the re-telling of fairy tales. Beauty and the Beast is one of my favorites. I love the Disney movie, my first introduction to the tale. I got to go see the musical (which I posted about) and I loved that. There are other movies available and I'm sure that people have seen parts if not all of them. There are more obscure tales that are worth checking out. The original (I believe) was recorded by the Brothers Grimm. It is a German tale called "Hans, My Hedgehog" ("Hans mein Igel" auf Deutsch). It is a little different. About a woman who badly wants a child and eventually has one who is mostly hedgehog, which earns him the scorn of his father. Anyway, it is kind of a long story but eventually he marries a princess who discovers that at night he sheds his skin to become a human. She is forbidden to do anything with it, but is tricked into throwing his skin into the fire. In anger, Hans deserts her. In repentance, she travels everywhere to find him and after suffering many hardships, she does. (Actually, rather like Psyche and Eros, especially if you've read "'Til We Have Faces" by C.S. Lewis. If you haven't read it, you should). For a brief telling, watch the first episode of "The Storyteller" from Jim Henson Co. I believe it is on Netflix, but here is a YouTube link. You can watch it in one part and I love this version: The Storyteller: Hans My Hedgehog. 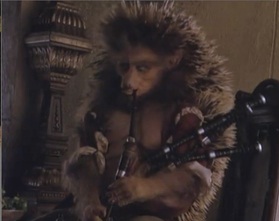 Hans and his bagpipes on which he plays tunes that "start with 'hello' and end with 'goodbye.'" An author that I often read writes several different versions of fairy tales (they aren't superb, but fun)--Mercedes Lackey. One series is an interesting take on the different fairy tales. The first book is the re-telling of Beauty and the Beast and it is called "The Fire Rose." It is the first in a series called "The Elemental Masters." Her other series is called "Tales of the Five Hundred Kingdoms." These are more silly, so don't read them as though they are serious (or they are much less enjoyable). The Beauty and the Beast story here is called "Beauty and the Werewolf" and it is an amusing mixture of Beauty and the Beast and Little Red Riding Hood. 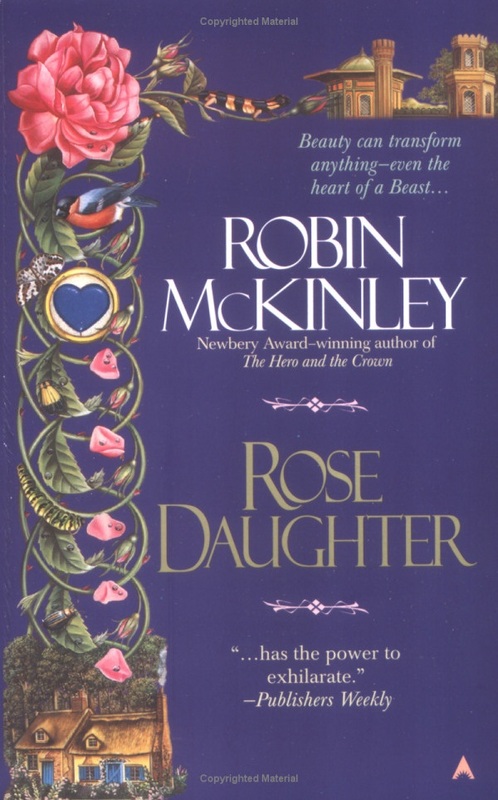 One of my very favorite re-tellings of this story is called "The Rose Daughter" by Robin McKinley. This one is very unique and I love it. Beauty has two sisters who have special and useful skills, but Beauty seems to only be able to grow plants. And roses, which only witches can grow. The scent reminds her of her deceased mother. When she comes to the Beast's palace, he asks her to take care of the roses, which are dying and she brings life back to his lands. Robin McKinley also wrote a book called "Beauty," which I long to read but have not yet. 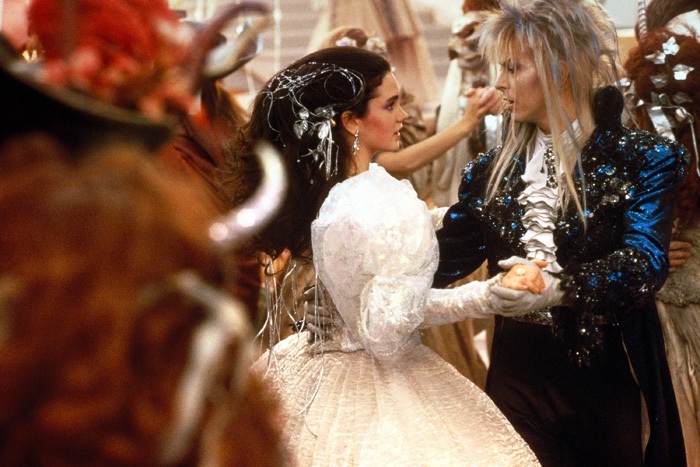 Even one of my very favorite movies, "The Labyrinth," is a sort of Beauty and the Beast story. I think that is one of the reasons I love it so much. And just for fun: Beauty and the Beat. I think this is hysterical. Anyone else have some good Beauty and the Beast spin-offs?